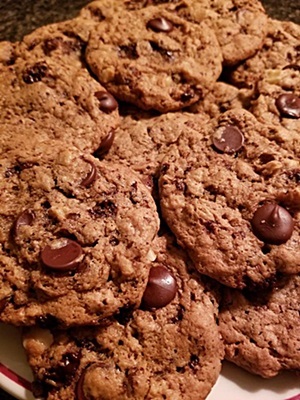 A unique blend of sweet and salty in a chewy vegan cookie loaded with chunks of chocolate. There’s a lot of ingredients but they are totally worth it! They can be made gluten free by using gf oats and a basic gf flour blend. In a mixing bowl beat softened butter with tahini and sugars. Add coffee, applesauce and vanilla extract and beat until creamy. In a separate bowl combine soda, powder, salt, oats and flour. Add dry to wet and blend well. With a spatula blend all together. Form batter into balls. Lightly press down on baking sheet and place a few inches apart. Bake for 8 to 12 minutes or until they start browning. For an extra zing, sprinkle the hot cookies with a little sea salt. Cool on wire rack, store in air tight container, if there’s any left!